Get excited, Terrier fans. BU hockey is just around the corner. 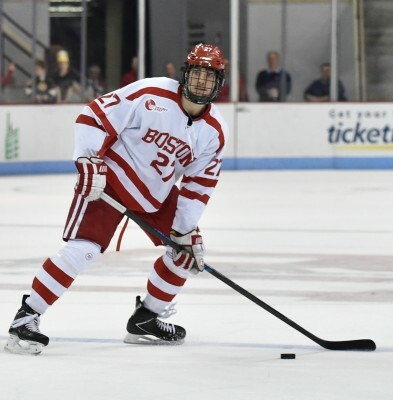 The Boston University men’s hockey team released the official 2016-17 roster on Wednesday, as well as announced the addition of three new staff members. The 26-man roster consists of 15 forwards, eight defensemen and three goaltenders. A whopping nine freshman will don the scarlet-and-white jerseys this season. Senior defenseman and Marblehead, Mass. native Doyle Somerby is this year’s team captain, while junior forward Nikolas Olsson and sophomore center Jakob Forsbacka-Karlsson have been named assistant captains. The roster announcement comes with just over three weeks until the Terriers host an exhibition against the University of Prince Edward Island on Oct. 1, and exactly a month until the season opener at Colgate University. As far as staff goes, former team manager Brittany Miller has been named the director of hockey operations, Kyle Czech is the team’s new strength and conditioning coach and Brian Eklund was named a volunteer assistant coach. He’ll focus on the program’s goaltenders. Miller served as team manager for the last five seasons, focusing on analyzing statistics and ice-time during games. She also made travel accommodations for the team and managed ticket requests. Miller even helped out with the team’s social media accounts. The first female to receive a full-time role on a Division I men’s ice hockey program, Miller earned both her undergraduate and graduate degrees at Boston University. She received a bachelor’s degree in business administration and management from the Questrom School of Business last year, and earned a master’s degree from the College of Communication this year. She will replace Chris Dyment, who spent one year at the position. Czech will serve as the team’s strength and conditioning coach, replacing Sean Skahan, who joined the Minnesota Wild this offseason as head strength and conditioning coach. Czech comes from Prentiss Hockey Performance in Connecticut, a prestigious training facility that has helped train NHL athletes like Jonathan Quick, Torey Krug and James van Riemsdyk. He has previously worked at both Clemson University and the University of Wisconsin. Lastly, Eklund joins the program after serving as assistant goaltender coach at Harvard University for three seasons. He owns Massachusetts Crease, a goalie school that has mentored goalies both in college and at the professional level. A 2004 Stanley Cup Champion with the Tampa Bay Lightning, Eklund played college hockey at Brown University before signing a two-year deal with the Lightning. The team’s third goaltender during their title run, he made his NHL debut in the 2005-06 season before playing two seasons in the AHL. Eklund replaces Mike Geragosian, who was the goaltending coach at BU for 17 seasons and helped the Terriers reach 10 NCAA tournaments. Click here to see the entire 2016-17 Terrier roster.